Bath Armor is a dry thermal media for use in water baths. 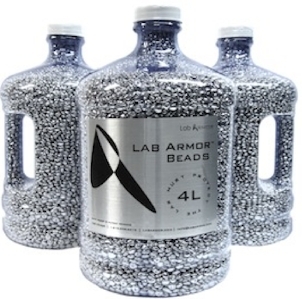 The aluminum beads provide a concurrent thermal & antimicrobial activity that efficiently shields the lab & personnel from invading organisms while thermally heating or cooling like water in any standard water bath. We recommend you fill your water bath 3/4 full with the beads. So if you have a 6L water bath we recommend at least 4L of Beads. Watch Video Demo Please choose below: 2L, 4L or 8L. If you need a large qty contact us for pricing. Use this helpful calculator to calculate how many beads you need in your water bath.